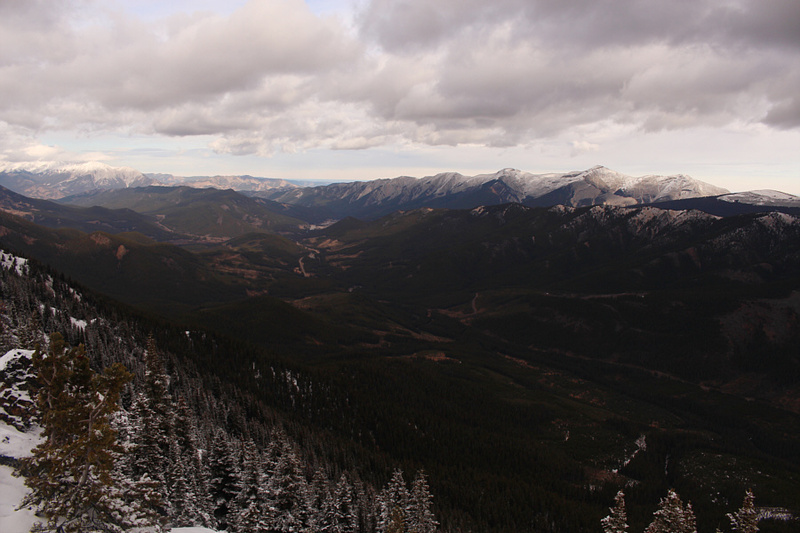 On 3 November 2018, Ali Shariat, Zosia Zgolak and I accompanied Bob Spirko for a hike up an unnamed ridge located between Cummings Creek and Wilkinson Creek near the south end of Alberta’s Kananaskis Country. For simplicity, Bob refers to this ridge as Wilkinson Ridge although this name has previously been applied by The Rocky Mountain Ramblers to another ridge (referred to as Ridge 735663 in Gillean Daffern’s Kananaskis Country Trail Guide) located further east between the Forestry Trunk Road and Plateau Mountain. 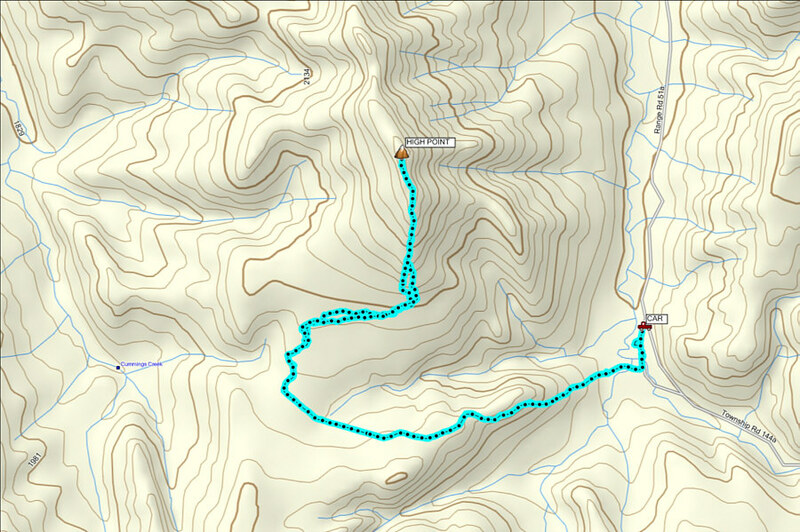 For our objective, Bob mapped out a route which follows a series of logging roads winding up the southern aspect of Wilkinson Ridge. From Highwood Junction, drive south along the Forestry Trunk Road (Highway 940) for 22 kilometres before turning right onto another road which is gated a short distance further. Park in a clearing just before a locked gate. 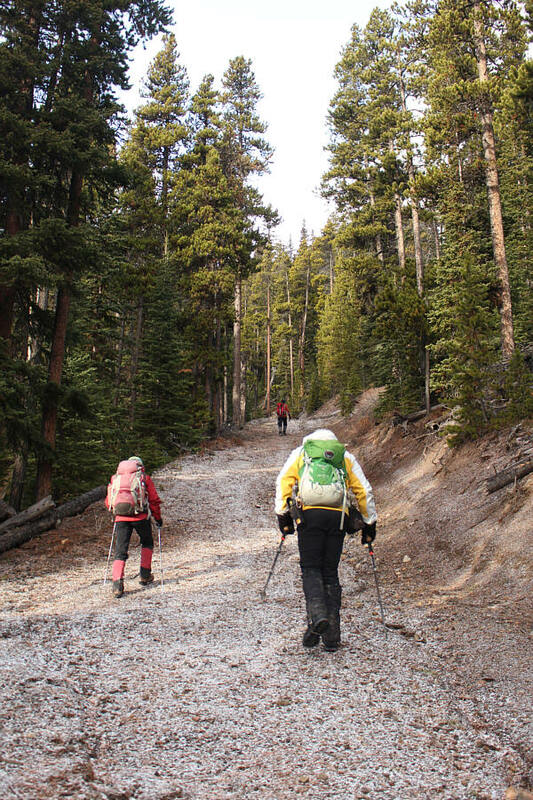 Note that this is the same trailhead for hiking up Pasque Mountain. Beyond the locked gate, we headed south along the continuation of the road and crossed Wilkinson Creek before turning right onto a side road. 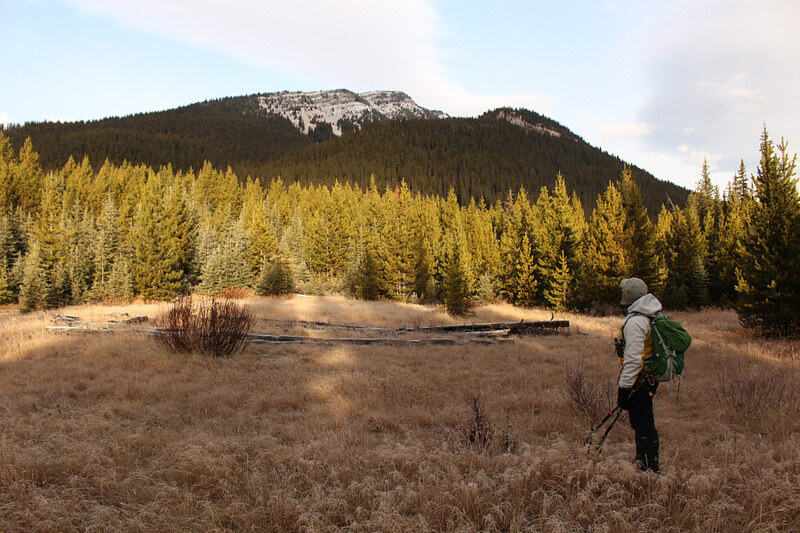 We immediately crossed a bridge over a tributary of Wilkinson Creek and soon arrived at an open meadow with clear views of Wilkinson Ridge. Sticking to the road, we began a steep and sustained climb over a minor ridge to reach a signed junction with Cummings Creek road. Turning right, we followed Cummings Creek road for about a kilometre until we reached what we expected to be an exploration road heading toward the southwest side of Wilkinson Ridge. 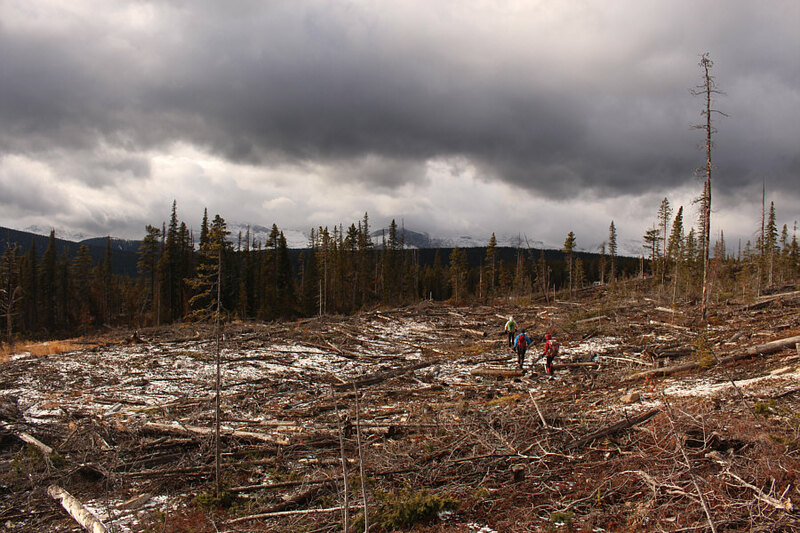 Instead of a road though, we found a swath of logging devastation cutting through the forest and subsequently widening into an enormous cut-block. 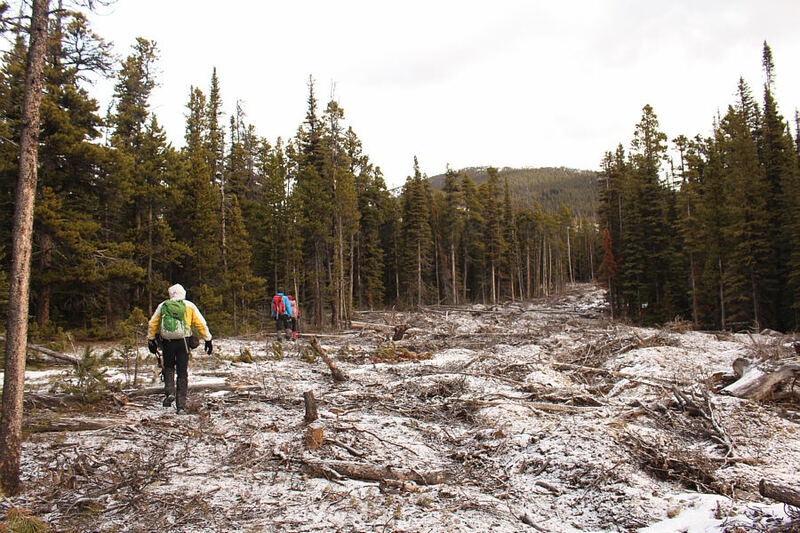 Initially, it was easier to bushwhack through the trees on the fringes of the devastation, but once we reached the cut-block, we had no choice but to plow through some unpleasant terrain full of logging debris. Be sure to check out Bob's trip report. 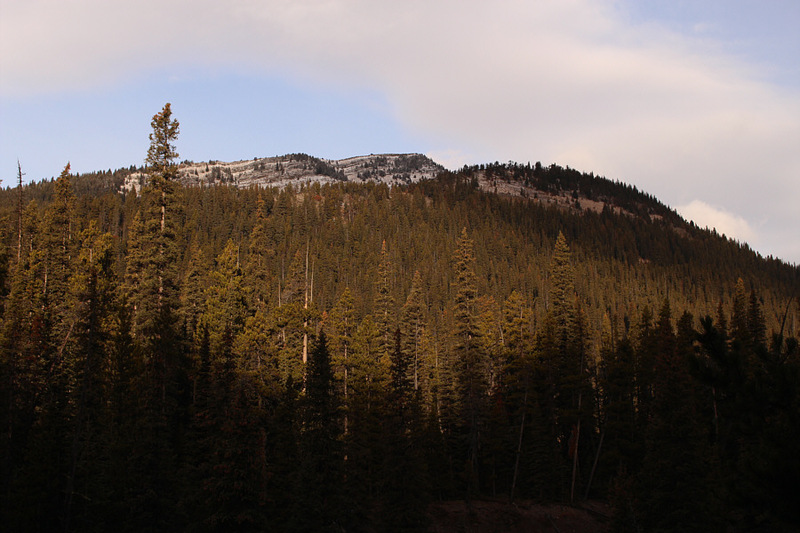 Wilkinson Ridge is visible from a break in the trees along Wilkinson Creek. 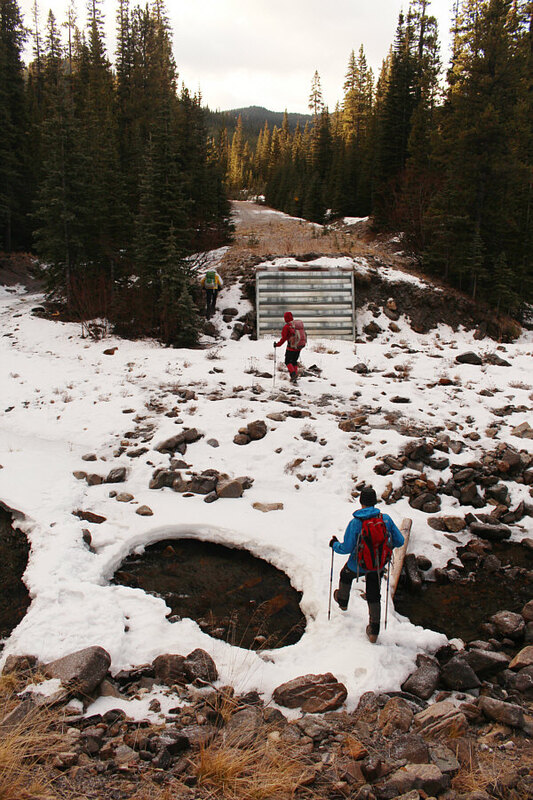 A snow bridge allows Bob, Zosia and Ali to easily cross Wilkinson Creek. Bob gets a clearer view of Wilkinson Ridge from a meadow along an exploration road. Zosia and Bob follow Ali up the exploration road. 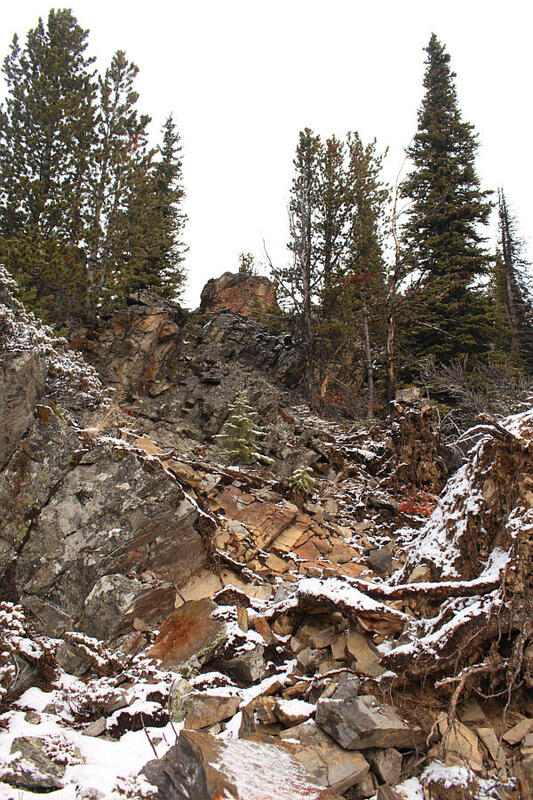 Because a hidden gorge would complicate a direct approach from this clear-cut along Cummings Creek road, Spirko's route winds around to far left before returning to the trees just below the rocky ridge at centre. Bob, Ali and Zosia turn off from Cummings Creek road to follow this swath of devastation leading to Wilkinson Ridge. 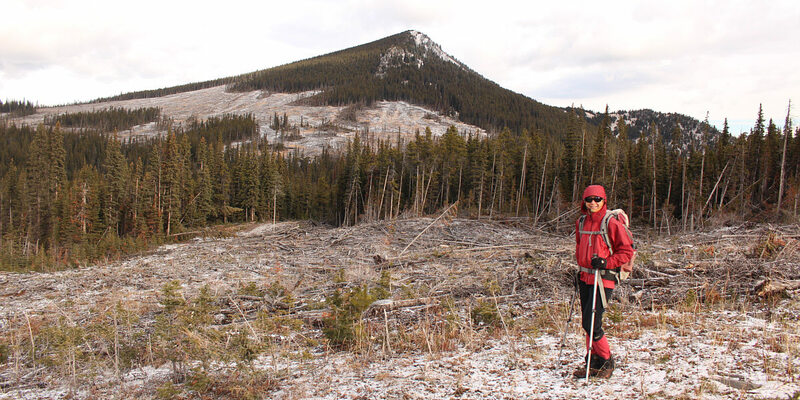 Ali, Zosia and Bob reach a large clear-cut on the southwest side of Wilkinson Ridge. Ali, Bob, Zosia and I eventually worked our way to the edge of the cut-block just below the south end of Wilkinson Ridge, and upon re-entering forest, we came across a reclaimed road which likely was the one that Bob had intended to follow after turning off Cummings Creek road. We did not stay on this road for long before leaving it to ascend the south ridge of our objective. 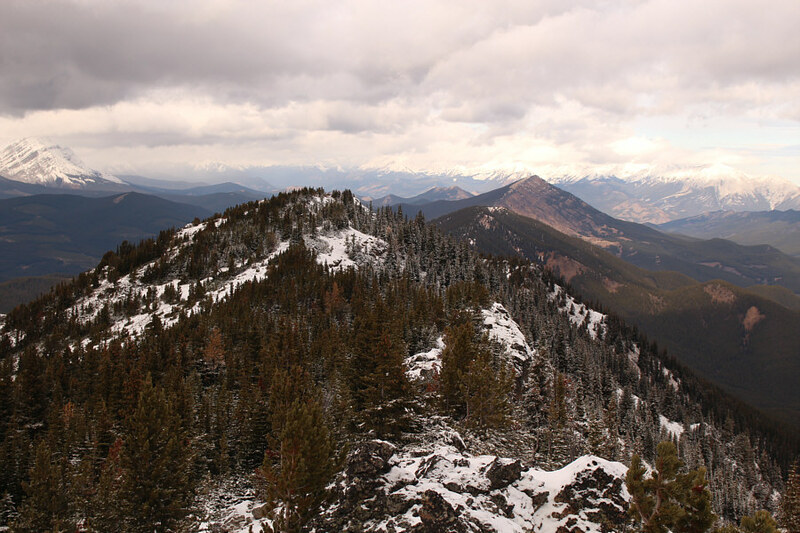 While Ali, Bob and Zosia hiked up a grassy slope slightly to the east, I opted to climb the rocky ridge crest which entails some easy to moderate scrambling. We reunited further up the ridge, and other than some slippery footing due to snow, we generally had no difficulties with the remainder of the ascent. 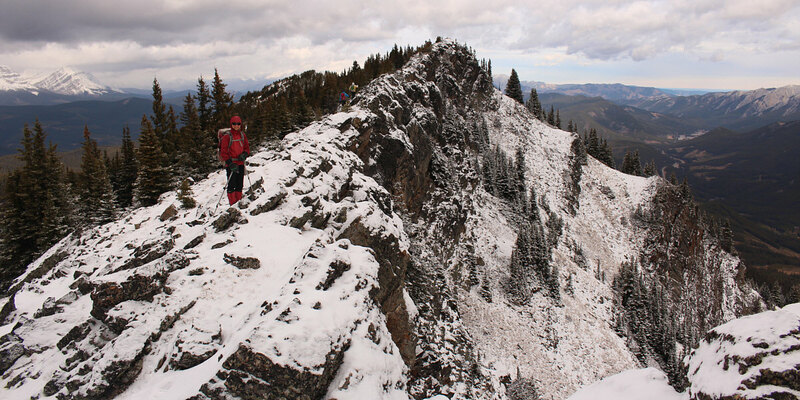 The rocky south ridge is mostly an easy to moderate scramble. 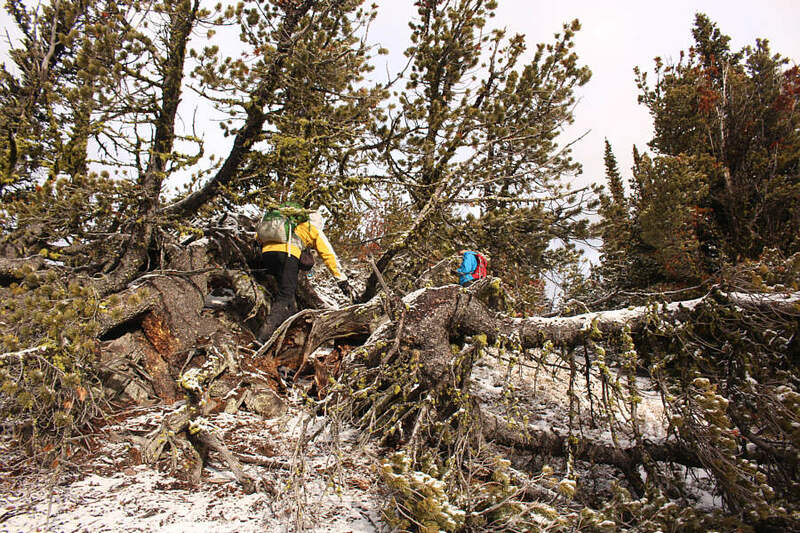 A few overgrown sections of the south ridge require some awkward maneuvers through the trees. The ridge becomes much easier to hike higher up. 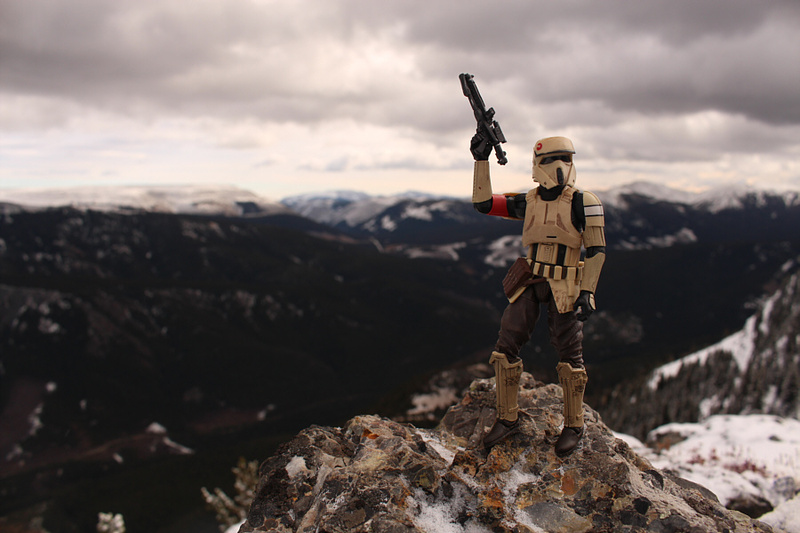 Here is the final approach to the high point of Wilkinson Ridge. 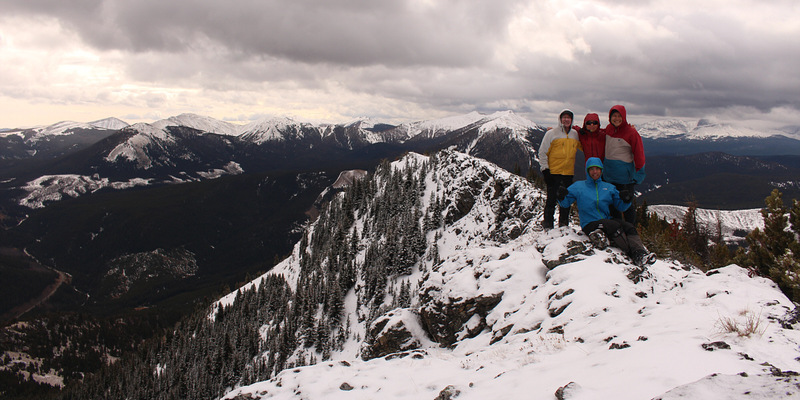 Bob, Zosia, Ali and Sonny gather near the high point of Wilkinson Ridge (2409 metres). Visible behind them to the south is Pasque Mountain (right of centre). The most notable feature to the north is Raspberry Ridge (right). Mount Burke (right) is visible to the northeast. Cool temperatures made it too uncomfortable to linger, and Ali, Bob, Zosia and I were on the move again after spending only about 25 minutes on the high point of Wilkinson Ridge. 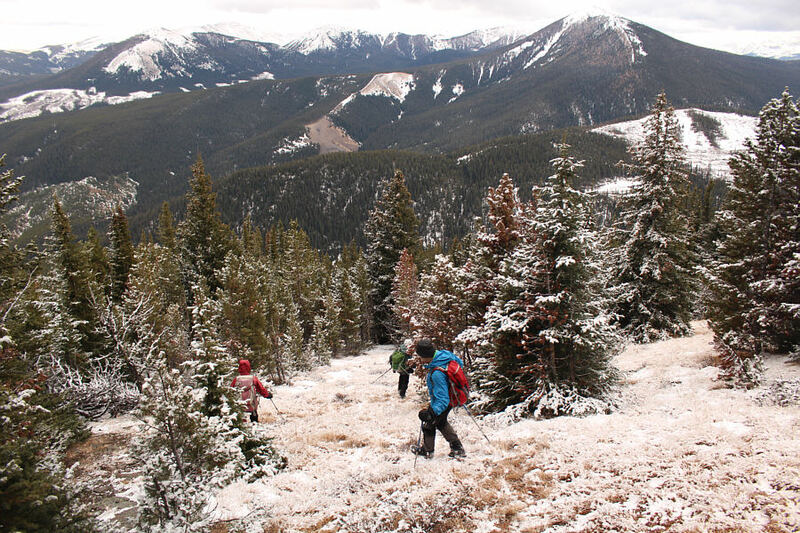 We all descended the grassy slope east of the ridge crest and followed the reclaimed road back to the cut-block. A second crossing of the cut-block felt just as unappealing as the first time, and we felt a measure of relief when we eventually regained Cummings Creek road. Despite some annoying uphill sections on the way back, our return to the trailhead was uneventful. 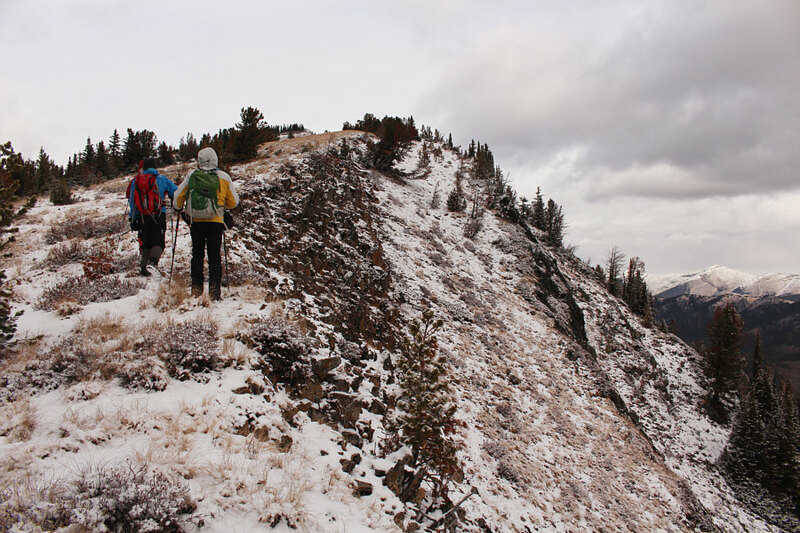 The group descends a slippery grass slope on the southeast aspect of Wilkinson Ridge. 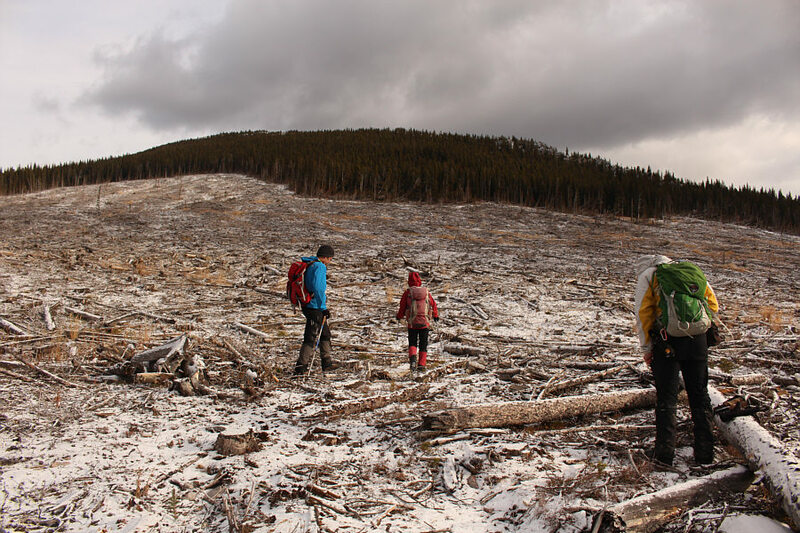 Bob, Ali and Zosia make there way back across the large clear-cut on the southwest side of Wilkinson Ridge. 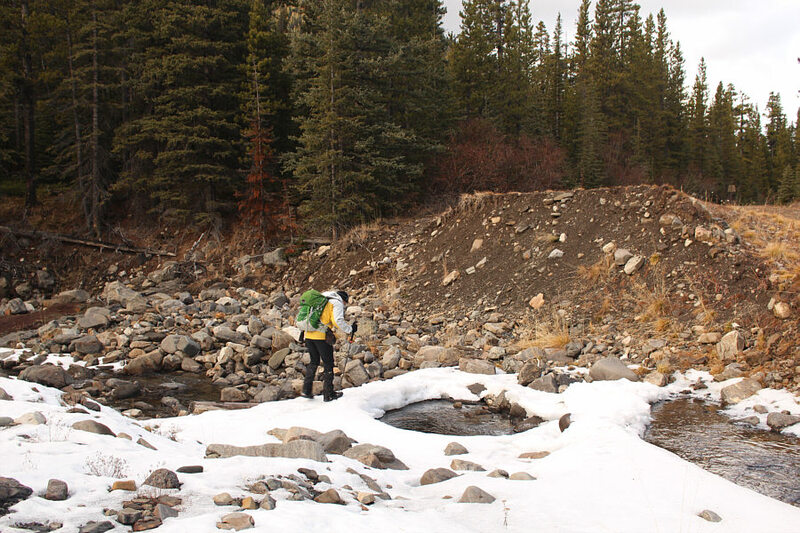 Bob re-crosses Wilkinson Creek on a snow bridge.